What you are testing for is the presence of voltage (potential difference) so that you are sure that the power is off before you work on any electrical circuit. The other way to use a voltage tester is for trouble-shooting a fault condition. I am going to assume that if you want to know how to use a voltage tester, then you already have a decent knowledge of electricity, and how the home electrical systems work. If not, then I suggest that you purchase the Basics of Household Wiring, either the DVD or in e-book form. This will give you a solid understanding of your electrical system. A voltage tester can be as simple as an inexpensive 2-wire neon light device, or as complex an expensive digital multi-meter with many analytical functions in addition to simply testing for voltage. A number of different options are available at the end of this article. For good instruction on how to use a voltage tester, generally the best reference is the instruction manual that should have been included with your meter or tester. Typically you are testing for power by checking from the suspected hot wire, to a grounded (earthed), or a grounding (neutral) conductor. Your voltage tester will have two test leads or wires that are insulated, but have a bare tip that allows you to make contact with the components of the circuit you are testing. You want to connect the black lead (common or negative if the leads are identified) to the neutral (white wire, silver terminal, or wider slot of a receptacle), or the ground or earthed conductor (green wire, bare wire, grounded metal box, or the semi-oval larger hole in a receptacle), making sure you have good contact. Then use the other test lead to touch the hot (black or red wire, brass terminal, or narrower slot of a receptacle) and see if the light of the tester comes on, or if the meter indicates the presence of voltage (whatever the case may be). If the meter or tester doesn’t indicate voltage, also check from neutral to ground to ensure that the circuit isn’t wired incorrectly and you have a hot neutral reverse condition. This is just a short tutorial on how to use a voltage tester. For more detailed instruction, I have developed a complex e-book on this subject which is available as an instant download. 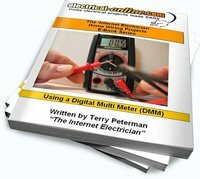 This entry was posted in Electrical Wiring and tagged circuit, circuit tester, continuity tester, digital multi meter, how to use a voltage tester, tester, voltage, voltage tester. Bookmark the permalink.